You might have a pair of blah shoes. Why not give them a makeover? 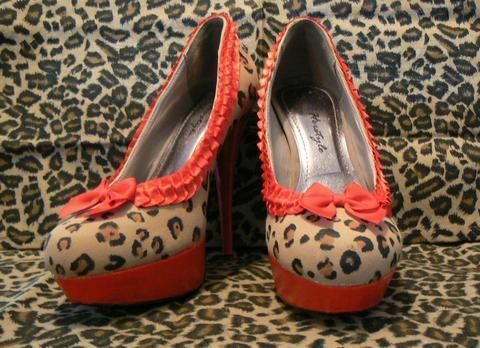 I wanted a pair of leopard print heels, but I couldn't find any that fit or that I liked a lot and didn't want to spend a fortune. 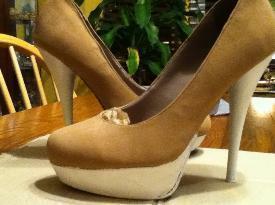 I went to Goodwill with my idea and after finding a pair of bland heels, I took them home and proceeded to remake them. 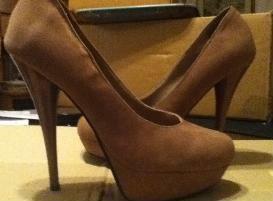 They were scuffed up, scratched suede heels. Now they're awesome leopard heels! Everything I used came from Hobby Lobby, except for the spray primer that came from Home Depot, and I suggest getting a printable coupon for the Mod Podge (which was $4.99!). EDIT: HAHA! I got a picture of them totally completed without the bobby pins!! Sorry the ribbon and paint look orange-y, its the Lumix's fault and the light I took them in didn't help. Find your shoes. I went to Goodwill for these. You might have a pair you like that just don't wow you anymore or you can check out Goodwill or other thrift stores to find your pair. 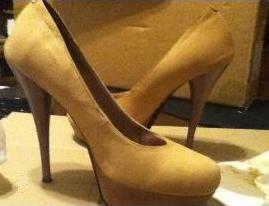 These are suede and I find them ugly (I'm sorry if anyone likes the color! Its just not me, haha). 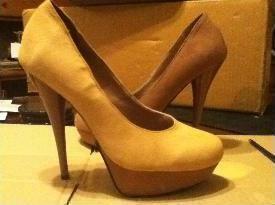 Apply your base color to one of your shoes. I used three coats of Anita's Acrylics in Latte while feathering the paint to make it even all over. 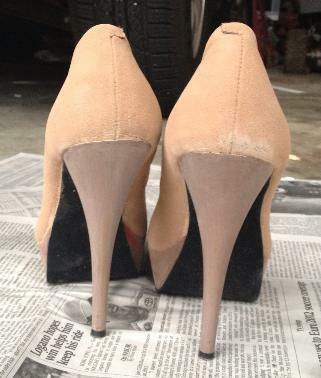 After you have painted both shoes, let them dry overnight. I left the platform unpainted for now. If you plan to paint your heel and its shiny plastic like mine, you'll want to sand them lightly so they have a frosted look. I used (I think!) 120 grit sandpaper and covered around the shoe and heel, as well as underneath, with Painter's Tape before I sprayed on the primer. After the excess primer (I used Rustoleum) had dripped off and had been left to cure for 24 hours, I brought them in and sat down to paint the platform with Liquitex Basics Acrylic in Titanium White (ironically, I have a titanium allergy :P). While that dries, you can move on to the next step. Choose what you want to use to do your leopard print. 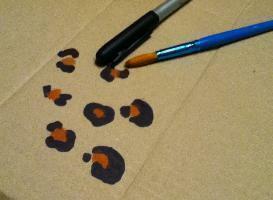 I used a black marker here to just draw some sample print on the cardboard I had laid down. 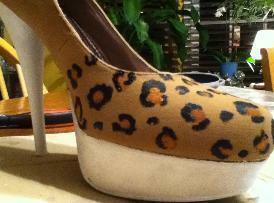 The interior color of the spots is Anita's Acrylics in Moccasin. These spots were done with the Liquitex Basics Acrylics in Mars Black on the tip of a q-tip and the Moccasin brown also on a q-tip. I chose this method because it looked more feathered and natural. After you finish the first shoe, set it aside to dry. 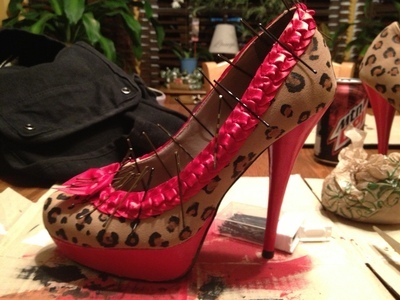 In the meantime,start on the second shoe. 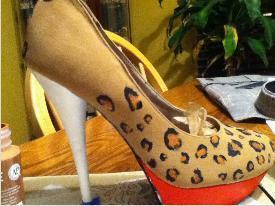 I painted the platform red with Anita's Acrylics in True Red before I started to do the leopard print. Another photo with my boyfriend's iPhone. (sigh...) Sorry for the light, I was sitting in front of a bay window while I painted. 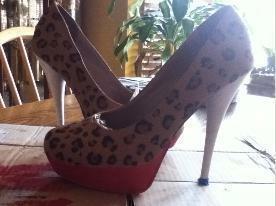 Here, both platforms are done and so is the leopard print. Just wait for them to dry. iPhone again. >_< After your shoes are dried completely all around, tape off around the heel and then you can begin painting it the same color as the platform. I used Anita's Acrylics in True Red again. Once I was sure the paint was 100% dry, I used glossy Mod Podge to seal the heal and plaform as well as add shine. 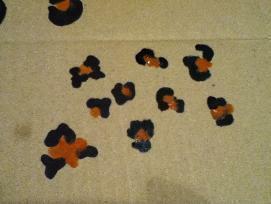 Once the Mod Podge has dried, you can attach the ribbon and bow. My ribbon was sewn in that ruffle-like way and I bought my bows pre-made (they come in a pack of 3 for $0.99). I used tacky glue and slowly wrapped the ribbon around the show so it would conform properly. To keep the ribbon and bow in place while the glue dried, I used bobby pins. 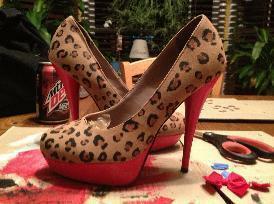 Let them sit overnight, just to make sure the glue dries. Put them somewhere safe to dry undisturbed!!!! THESE ARE SO COOL. And now I really have to get some rubbish shoes to give them new life. Girl, I thought you just put the ribbon on. I didn't know you did all the painting too. Good stuff. Haha, yeah I did. And thanks!! Fantastic, they dont look like the same pair of shoes. Thank you! Shows what a little paint and an idea can do to some shoes.